La Gaspésie Should Be On Your Photography Bucket List. Here’s Why. The Cap-des-Rosiers Lighthouse, in Forillon National Park, Quebec is only one of many reasons to visit La Gaspésie! The fireweed (the purple flowers) that cover ditches and hillsides all over the province in the summer are another. Photo by Tracy Munson. There are dozens of reasons to visit La Belle Province (that's “The Beautiful Province” for those who lack even obvious French and it refers to Quebec, for those who lack a Canadian heritage). The fresh seafood, the people, the rich culture, the European vibe, the cheese, the cities, the cathedrals, the art, the skiing, the ice hotel, the marine life, the fjords, the smoked meats, the wildlife, the camping, the hiking…well, I could go on but suffice it to say, je t'aime Quebec. The Gaspé Peninsula offers a combination of all the best French food and culture, with a maritime twist and outstanding scenery at every turn. From marine wildlife viewing opportunities to the iconic pierced rock in Percé, here is a small sampling of the wonders to behold (and photograph!) in this amazing region. If you'll be doing photography here, be SURE to get our new free iPhone/iPad app with tons of great spots to take pictures in the area. It' s a free app called Really Good Photo Spots and you can download it right here. For a month every Spring and again in the Fall, Snow Geese in the tens and even hundreds of thousands arrive at the base of the Gaspé Peninsula. Midway through their migration, they take a break to feast on roots and seaweed in the mud along the shores of the St. Lawrence. The area on the South Eastern shore of the St. Lawrence, from Montmagny to Cap Ignace is one of the best places to view this awesome spectacle. Ideal times of year to visit are from mid-April to mid-May and then during the month of October, as the geese make their way south once more. The tide levels are also an important consideration when planning a visit because the birds may be too far away at low tide for you to get great photos of them. When the tide comes in, the mudflats the birds forage in grow smaller and the birds are pushed in closer to shore. You will definitely want to bring a long telephoto lens for the many wildlife viewing opportunities in this region. Extra pro-tip, make sure you bring and USE your monopod, I gave myself a terrible case of “telephoto elbow” on my last trip, from hoisting up the 150-600mm lens dozens of times a day. Who doesn't love a good lighthouse? The Gaspé region is chock full of beautiful lighthouses, like this one, the Pointe Au Perè Lighthouse in Rimouski. Photo by Tracy Munson. History buffs and architecture admirers could easily occupy a week or two along the shores of the St. Lawrence, just visiting lighthouses alone. The Gaspé Region is home to some exceptionally photogenic and historically interesting lighthouses, like the wonderful buttressed Pointe Au Perè Lighthouse in Rimouski. While you're there, you will also want to visit the decommissioned Onondaga Submarine, which is right next door to the lighthouse. It is really quite an imposing sight and is open to the public as a museum, so you can see what it is actually like inside the cramped quarters. Not recommended for the claustrophobic! Some of the lighthouses have been converted into hotels or B&B's, like the Pot à l’Eau-de-Vie (Brandy Pot Island) Lighthouse, in Rivière-du-Loup and the nearby Île Verte Lighthouse. If staying in a lighthouse tickles your fancy, it is certainly a convenient way to be at your photo location in time for sunrise! 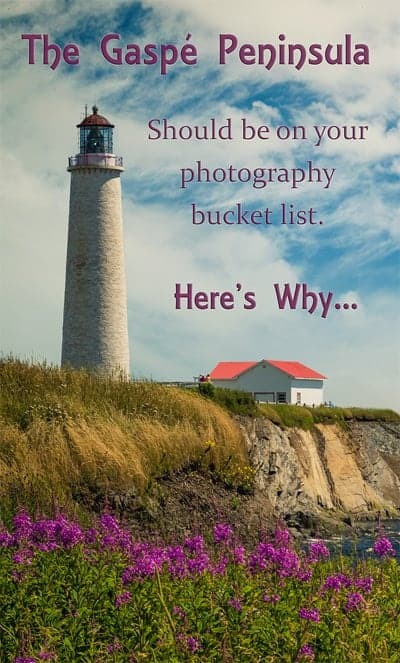 That's still not even all of them, but if you're a real lighthouse lover, you may be interested in travelling the Lighthouse Trail to see more of the lighthouses in the region. 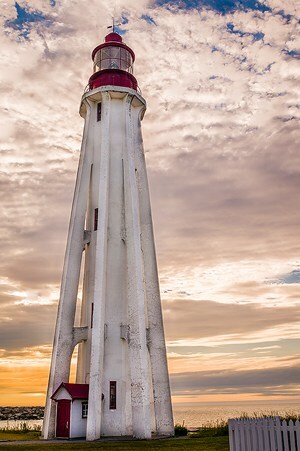 If you are photographing lighthouses from up close, you will need a wide angle lens. I've gotten some great results with the Laowa 15 mm lens, which has a shift feature that is very useful for combatting distortion in these situations. Of course, if you own an actual tilt shift lens, that would be even better. Another way to solve the problem is to photograph the lighthouse from further away, with a longer lens. 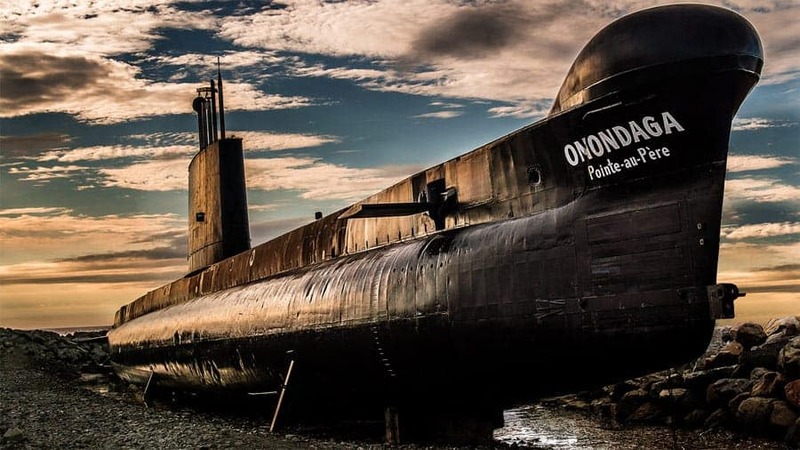 The decommissioned Onondaga Submarine is open to the public, at the Pointe-au-Père National historic site in Rimouski, QC. Photo by Tracy Munson. As you drive north from Rimouski, and find yourself passing through the quaint town of Ste. Flavie, you will suddenly be amazed by the sight of a hundred or so human-sized statues walking out of the St Lawrence River. If you are anything like me, you will slam on your brakes and nearly get rear-ended, the first time you see this surreal art installation. The Québécois(e) like to drive fast, so be extra careful! Some of the statues are arranged in tableaux, upon rafts wired to the shore so they float when the tide is in. The statues are the creation of artist Marcel Gagnon and there is a restaurant, a shop, and a small hotel right on site at the Centre d'Art Marcel Gagnon. I always like to spend a night in Ste. Flavie so that I can visit La Grand Rassemblement (“The Great Gathering”) during high tide, low tide and in different lighting conditions. 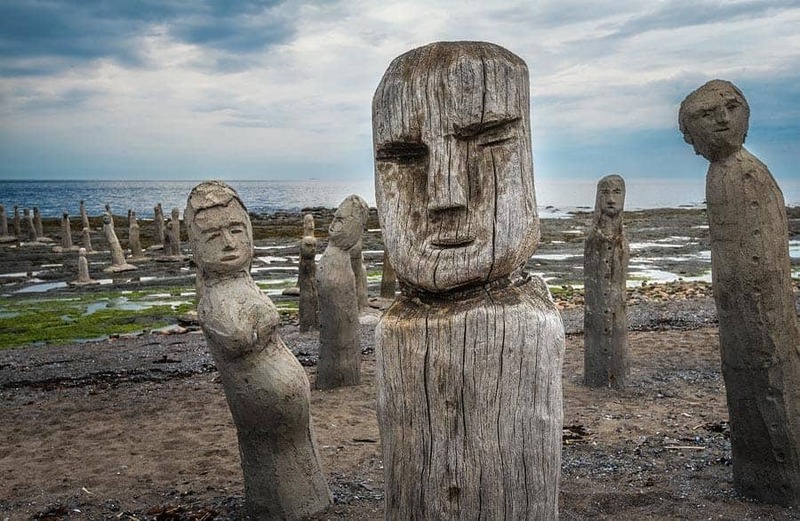 The 80 life-sized statues of “La Grand Rassemblement”, Marcel Gagnon's amazing art installation on the shores of the St. Lawrence river in Quebec, lend themselves to endless compositional possibilities. Photo by Tracy Munson. Even on sunny days, fog clings to the cliffs at Cap Bon Ami in Forillon National Park. Photo by Tracy Munson. The soaring cliffs of Cap Bon Ami, in Forillon National Park, seem to rise through the fog at impossible angles. Up close, unusual swirling patterns can be seen in the rocks. The lookout affords a panoramic view and on a clear day, you can even see the Cap-des-Rosiers Lighthouse in the distance. If you take the stairs down to the beach, you may be treated to the sight of seals frolicking in the surf, while tiny waterfalls trickle down a moss covered cliff behind you. For the ambitious, there is a steep, 3.8 km (2.4 mile) return hike up to a tower for an even more incredible view of the region. The trail continues on from the tower, for the option of a longer, 7.8 km loop (4.8 miles). 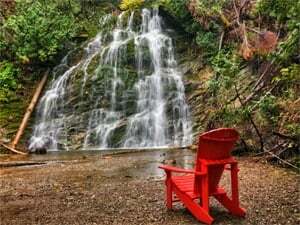 Parks Canada considerately leaves these red Muskoka chairs around in scenic spots, to give you a foreground element for your photos. Photo by Tracy Munson. For the less ambitious, the 1 km loop (0.62 mile) trail to the “La Chute” waterfall is steep in parts and has a lot of stairs, but is a relatively short hike for the payoff. The trail can be quite muddy and slippery, so I would recommend a walking stick. Even on a day when the weather is dry, there is some spray from the falls, so bring a micro fibre cloth to keep your lens dry. Most of the wildlife that lives in Quebec can be found in abundance in the sparsely populated Gaspé Region. Forillon National Park, at the northern tip of the peninsula, is an especially likely place for encountering land mammals like Black Bear, Moose, Foxes, and Porcupines. Marine mammals like Seals and many species of Whales can often be seen swimming by, even from shore! Whale watching boat tours are available from many of the ports along the St. Lawrence and out into the Gulf, for those who want to get an even closer encounter with some of these magnificent creatures. Bird watchers won't be disappointed either, as Bald Eagles are frequently seen soaring overhead and dozens of species of sea and shorebirds can be seen, as well. I live in Canada and I spend a lot of time camping and cottaging in wilderness areas. 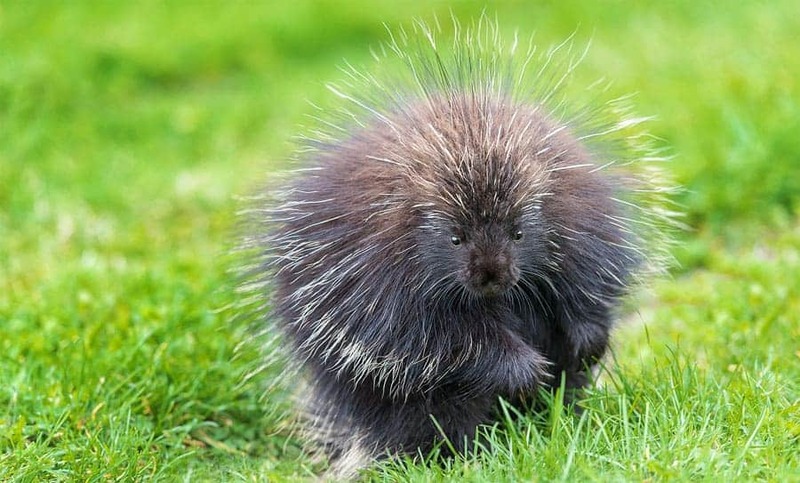 Even so, every wild, living porcupine that I have seen during my adult life has been in Forillon National Park, at the tip of the Gaspe Peninsula and I have seen over a dozen in a single day there! Awesome place to photograph porcupines. Terrible place to let your dog run off leash. Photo By Tracy Munson. The striped and colourful rock formations of Bonaventure Island look like something Dr Seuss might have imagined. Even over the roaring engines of the ferry, the deafening sound of tens of thousands of gannets is something you will never forget. The smell is pretty memorable, too. Photo by Tracy Munson. 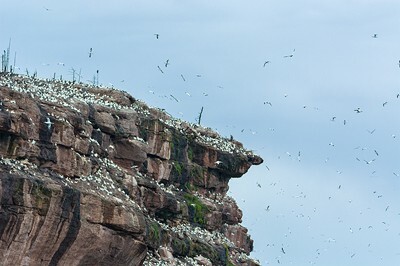 Bonaventure Island, near Percé, is home to one of the world's largest breeding colonies of Northern Gannets, with over 45,000 breeding pairs returning every year. If you've never seen one, a Gannet is an impressive, white seabird with black wing tips, a yellow head and striking blue eyes. When a Gannet folds its wings and plunges straight down into the ocean to catch a fish, it looks like a cross between a fighter plane and a dart…or perhaps those things were designed by someone who had seen the aerodynamics of a Gannet! Murres, Gulls, Puffins, Guillemots, Auks, Razorbills, Cormorants, Kittiwakes and Terns are some of the more common visitors of the 293 species of birds that have been recorded on the island. That's a pretty impressive number for an island that only measures 4.16 square km (1.61 square miles). The island was once inhabited by a small fishing community, but the province of Quebec expropriated the land from the remaining few families in 1971. There are still the crumbling remains of a few houses on the island, which is now inhabited only by birds and seals. I have saved the pièce de résistance, the Rocher Percé for last. For a start, the town of Percé is very charming on its own, but the with the sight of that giant, multi-coloured pierced rock as its centerpiece, I really can't think of any town I've seen that can rival it. At low tide, it is possible to walk out to the rock, but falling rocks are common, so caution is required. My favourite place to stay in the area is the Côte Surprise campground, just outside of town. It offers an amazing view of the rock and I love being able to keep an eye on the sunrise from the relative warmth and comfort of my tent and then only have to spring into action and put on pants to go outside if the sky starts getting awesome. The rock tends to get some nice, warm light hitting it in the evening, just before sunset, which makes it look really reddish-orange, but the sun rises behind the rock and that is the best time to get the dramatic and colourful skies behind it. From the town of Percé, ferries travel out around the pierced rock and then to Bonaventure island, many times a day. You can get off the boat on Bonaventure Island and hike across to the bird colonies or explore the abandoned houses and catch a later ferry back to the mainland. 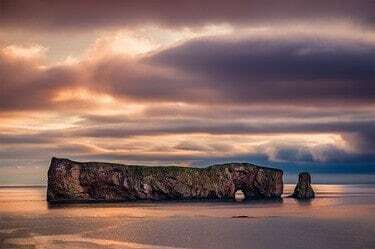 Unfortunately for photographers, it is not possible to stay on the island in order to be there for sunrise and sunset, but you can probably keep yourself occupied on the mainland, with the view of the Rocher Percé. Many whale watching cruises and zodiac boat tours are also available from the town of Percé, as well as opportunities for scuba diving and snorkeling with seals. You will want to take a wide angle lens out on the boat with you, as well as a telephoto because the island and the shoreline back towards the town are very scenic. Please do not be intimidated by the French language issue. Most Québécois(e) in the cities speak at least some English and I have always found those in the more rural areas who don't speak any English to be extremely friendly and helpful, nonetheless. A simple “bonjour” (good day), a “s'il vous plait” (please), and a “merci” (thank you) are usually all the French you will need to receive good will from your Quebec hosts, and that basic effort is just good manners. If you still aren't convinced that La Gaspésie holds enough attractions for you, keep in mind that I travel with two dogs, who are not allowed in any of the Provincial Parks, so I have only been able to scratch the surface of the wonders held by the region. Some of those areas that are off limits to me look pretty spectacular and I can't wait to see them vicariously through the readers of Improve Photography! Make sure to drop me a line and let me know what I've been missing.